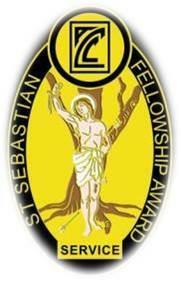 The St Sebastian Fellowship is an award of merit bestowed by the ACC upon any person whose service to the Association or member school has been exceptionally meritorious and long standing. Through their work with ACC sport and in pursuit of its mission, the recipient must exemplify the spirit of St Sebastian; strength, endurance, perseverance, courage and justice. To be considered for nomination an individual must have contributed across numerous facets of the organisation (and been a strong contributor in each area), and have been significantly involved in the development of the organisation. It should be considered that the nominee has completed a minimum of fifteen (15) years service involvement with ACC sport or has made such a contribution as to be deemed ‘exceptional’. Nominations for the St Sebastian Fellowship Award may be made by any ACC member Principal, Sports Coordinator or the Director of Sport and must be supported by at least one other member school Principal or Sports Coordinator. The St Sebastian Fellowship award is not self-nominated and requires an independent proposer and seconder. The St Sebastian Fellowship award requires "nominee confidentiality" and the nominee should not be advised of their nomination for the award by the proposer. All nominations must be submitted through the on-line nomination form, to the Director of Sport and must include a statement specifically detailing the nominee’s involvement with ACC Sport. Nominations must be received by the end of August in the year of nomination. No other form of nomination will be accepted. The award should be considered a "life time service to ACC sport award". Preparation of the award nomination should be a school responsibility and not simply left to the current Sports Coordinator to complete. Nominations should be coordinated by the Principal with input from senior management, sport/PE staff (past and present) and the school PR/media officer. The St Sebastian Fellowship Award can be retrospective and the award bestowed upon individuals who are retired and not currently employed or not actively engaged in ACC activities and events. Years of active service prior to 2013, the year the awards were first introduced, can be counted towards the total service record. Service years can be cumulative across ACC schools/employers. Upon receipt of a nomination for the St Sebastian Fellowship Award of the ACC, the ACC President shall invoke a four (4) member sub-committee to assess the nomination and make recommendation to the ACC Executive Committee of Council. The sub-committee will include the President (or Director of Sport) of the ACC, one serving member of the ACC Executive Committee, one Sports Coordinator (if not the Executive Committee Member), one Principal (if not the Executive Committee Member) and a representative of the ACC St Sebastian Fellowship group. receive a complimentary invitation to the annual ACC awards function. The St Sebastian Fellowship Award is acknowledged as superior to all other ACC awards.